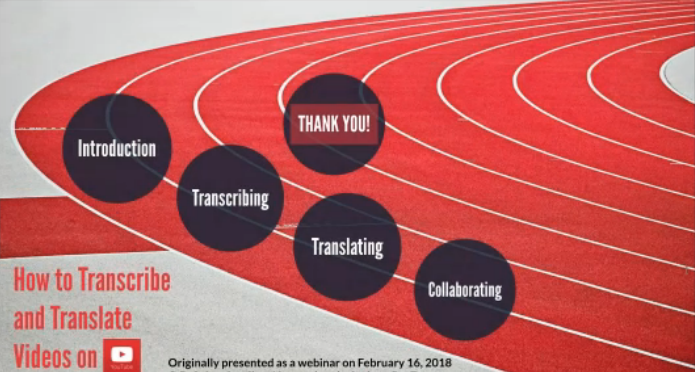 On February 16, I presented a webinar on how to use YouTube for subtitling purposes. This webinar session, "How to Transcribe and Translated Videos on Youtube," was offered through Proz.com. Below you'll find questions that were asked during the webinar, as well as some other comments that were sent to me by email. If you purchase access to the video, have questions after watching the material, and don't see your concerns addressed here, feel free to contact me and contribute to this Q&A list. How can I start looking for subtitling clients? Just as you would go about finding translation clients, you'd also need to look for companies that need subtitling services. Think about the areas that would have a good demand. Brainstorm where there is a need for your services. Put your resume together, start practicing, and do the legwork of actually researching your potential client base. You can also pay attention to job boards, like Proz.com, or other freelancing websites, such as LinkedIn, where people can post information on their subtitling project and connect with professionals offering their services. There are companies that need their instructional videos translated, so employees worldwide can complete their corporate training. There are universities interested in showcasing their campus and courses to international students. There are video producers and entertainment companies working with a large variety of materials, from short commercials, news stories, and interviews to full-length documentaries and movies. The possibilities are literally endless! How can I get hands-on practice transcribing and translating videos on YouTube? If you don't have videos of your own, you can practice with stock videos that are available for download. Check out the websites below to download MP4 videos, upload them to your YouTube channel―making sure you keep these videos private―and start applying the skills you've learned during this webinar! Apart from that, as we discussed it during the live presentation, you can also look for subjects of your interest on YouTube and check if the video is available for community collaboration. That way, you can offer your translations to YouTube content creators, either as a volunteer as you're learning how to work with subtitles, or as a service provider, when you're comfortable with your subtitling skills. Is it possible to import subtitles into CAT tools? Absolutely. Once you're done with the transcription, you can export a plain text SRT file and then use your favorite CAT tool for translation. That will be extremely helpful if you're working with the same client on a regular basis and want to keep a translation memory. You'd also be able to use your glossary to assure terminology consistency, which always comes in handy. Once you're done with the translation on your CAT tool, you can import the translated SRT back into YouTube and review your subtitles in the target language. How should I charge for subtitling work? Sometimes clients are okay with paying your per-minute rate for the transcription portion of the assignment, then have you apply your regular per-word rate for the translation, based on the final word count after you've transcribed the entire video. That's the perfect scenario if clients don't demand to know exactly how much they'll be paying for the entire project beforehand, since you'll only find out the word count once you're done with the first part of the project―the transcription itself. The main thing is to always talk to clients beforehand, so both of you are on the same page and know what to expect from one another. What happens if the client doesn't want you to work on the transcription and require audio-to-text only? There's always a chance clients will tell you they can't afford to pay for transcription + translation. In that case, you would have to listen to the original and type in the target language. That is tricky, though, because you're doing three things at once: hearing one language, synchronizing when subtitles begin and end, and typing another. If your client refuses to pay for transcription and requests translation only, meaning that they want only the subtitles in the target language synchronized with the video, try to estimate the time it'll take you to complete the project as being 1.5 or 2 times longer than it would have taken you to do the transcription and then the translation. So, let's say that you can work on 10 minutes of video in two hours, estimate that you'd be able to finish those 10 minutes in 4 hours instead, just to give yourself enough time. Isn't transcription more expensive than translation? If someone is a transcriptionist and transcribes for a living, they'll most likely charge more for it. However, when working with translation clients who need their audiovisual materials transcribed AND translated, their frame of mind is that you'll be putting less effort in transcribing the recorded content ("You're just typing what you hear!") when compared to the actual work of translating the message into the target language. It all comes down to a value-added perception, so it's easier for you to charge "X" for transcription and "X times 2" for translation and make sure that the total price is covering the time you'll invest into the complete service. What happens if a client only sends me a link to their YouTube video, instead of a file? Then they would need to make sure that the video they've already uploaded to their own channel is actually available for community contributions. To double check that, click the ellipsis below the video and select "Add Translations." If you're taken to a page where you can select your target language, you can start providing services to the client. If YouTube tells you that the video isn't available to community contributions, you must let the client know that they need to select that option to give you access to the translation page within YouTube. Since there isn't a legal way of downloading YouTube videos that don't belong to you, in case the client doesn't want to release the video for community contributions for some reason, they would have to send you the video file itself, so you can upload it to your own YouTube channel, making sure the video stays private, so you're the only one who has access to it, and then you can follow the process shown here to transcribe and translate the material. Can I edit the transcription on a client's YouTube video before working on the translation? Good question! As far as I can see while translating my own videos, the transcription (original language and timing) is "locked" once a translator starts typing the subtitles in the target language. So, if a client hires you to translate their subtitles and the original transcription isn't 100% ready to go (i.e. the client used YouTube's automatic speech recognition and synchronization) and things don't look professionals (i.e. words are spelled wrong or three lines are displayed on the screen instead of up to two lines) you can try to convince the client to let you edit the transcription first, to make sure it reads correctly before you start translating the content. In that case, you'd ask the client to download the SRT file containing subtitles that were generated automatically by YouTube with Google speech recognition technology, so you can edit it correctly. Then, the client can upload the final SRT to the video and you can select your target language to finally translate it! Is there a feature to avoid subtitle overlapping? Yes! YouTube will prevent you from entering a subtitle before the previous one is off the screen. In other words, if you set one subtitle to begin before the previous subtitle ends, YouTube will just revert back to the previous timing and you'll have to change the beginning and ending times correctly. As an alternative, you can use the slide guides to make sure you adjust the timing correctly. In other words, if subtitle #1 ends at 00:00:05 and you try to make subtitle #2 start at 00:00:04, YouTube will force the latter to read 00:00:05 to make sure the second subtitle only appears on the screen once the first subtitle ends. How much editing usually goes into subtitling projects? It all depends on the video, really. How fast is the person speaking? How clear is the audio? It is a documentary with many transitions with soundtrack only, and no speaking? Sometimes you have someone who talks veeeery sloooowly, so you're able to type what you're hearing without going back and forth because you missed something. Other times, you have people who talk too fast, so it'll take you longer to type everything, or you'll have to edit the subtitles because you didn't catch a word or two the first time around. I personally like working on it from beginning to end to catch as much as I can the first time around, then I watch the video and read the subtitles and do some editing, not only in terms of words I may have missed or typos I've overlooked, but also to make sure that everything fits nicely on the screen and people can read the subtitles comfortably while watching the video. Is there a way to add boxes on the top of the screen while subtitles are shown at the bottom? As far as I know, YouTube doesn't have that capability. I've only been able to do it on advanced subtitling tools. The same goes with DotSub, the other online subtitling solution I use. However, as a viewer, YouTube allows you to change subtitling properties, such as size and font color, but that customization is not available to subtitlers working on YouTube. It's another online subtitling tool that I use, especially while working with translation colleagues when clients request subtitles in different languages. I've actually taught a webinar about it on Proz, so feel free to check it out here if you're interested in learning more about it. DotSub actually pulls videos from your YouTube channel, and the main difference is that YouTube is a video posting/sharing website that ALSO allows content creators to add subtitles and translations to their videos, while DotSub is a subtitling collaboration platform. How do YouTube and DotSub compare, as far as online subtitling solutions? They are very similar, but each has its own advantages and disadvantages. DotSub has keyboard shortcuts you can use to enter the starting and ending times for your subtitles, while you have to enter numbers manually on YouTube. On the other hand, YouTube has that timeline area, where you can slide the beginning and end of subtitles to adjust them accordingly. You can also see the audio track, so it helps a lot when timing your subtitles if you're a more visual person.